Join us for the first of our HISA Breakfast Series for 2017!! We set the scene for 2017 with a targeted discussion on digital health, informatics and its importance and contribution to health system change. The landscape is rapidly evolving and changing as our world continually goes digital, with increasing focus on innovation and the use of data, and renewed commitments and priorities from Government and health providers on driving and embracing system and service change. A person-centred approach is central to that change – whether it be health practitioner, patient, carer or consumer. How is digital health and informatics improving the health system for patients and clinicians? How are we designing systems to support a people-first approach? Are we inclusive and designing systems and solutions for all stakeholders and users? With the increase in digital solutions and electronic records is our data safe? How do we address Cyber Security? How do we design and use technology solutions to make the patient and clinicians experience better? This event is complimentary – please register soon for this unique breakfast as numbers are limited. We look forward to welcoming and seeing you at the event. Associate Professor Chris Bain Chief Health Information Services Manager, Mercy Health. Dr Martin Seneviratne Resident Medical Officer Royal Prince Alfred Hospital, and Emerging Digital Health Leader. Sue McCarthy Chief Nursing Officer, Datacom Healthcare Solutions. 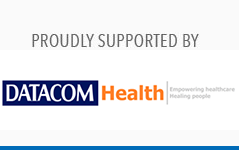 Delivered in partnership with Datacom Health Solutions, our HISA Breakfast Series partners, we look forward to your participation and attendance at the event. Associate Professor Chris Bain, Chief Health Information Services Manager, Mercy Health: Chris is an experienced former clinician, having worked clinically across the healthcare spectrum, and a health IMT practitioner, with a unique set of qualifications. He is an Australian leader in UX. He has extensive experience in designing, leading and running operational Information Management and Technology functions in healthcare organisations. He is also an active researcher and supervisor of post graduate students, with an adjunct appointment in the Monash University Faculty of IT . His chief interests are in the usability of technology in healthcare, data and analytics, software and system evaluation, technology ecosystems and the governance of IT and data. Dr Martin Seneviratne Resident Medical Officer Royal Prince Alfred Hospital, and Emerging Digital Health Leader: Martin is a junior doctor with a background in software development. On the side of clinical medicine, he has worked on several health-tech ventures including WardConnect (Founder), CancerAid (CTO) and HealthNavigator (as a visiting researcher with the mHealth division of the George Institute for Global Health). Martin currently serves as a Board Member and clinical governance advisor for NEHTA and in 2017 will continue postdoctoral research in clinical informatics at Stanford. Sue McCarthy RN, MACN, Grad. Dip. Business (Monash), Chief Nursing Officer, Datacom Healthcare Solutions. Sue McCarthy is AHPRA registered and maintains her credentials by meeting recency of practice and CPD requirements. In January 2016 Sue became qualified in the art of cosmetic injecting. Her interest in health informatics came about while she was nursing and asked to “use this new system”. Unfortunately, this new system didn’t really enhance clinical practice and Sue thought it was time to find out why – she soon found out. Many point-of-care clinical systems have been designed without consultation and input from treating health professionals and this has led to low adoption and high failure rates of systems. Sue has a passion for ensuring that health IT applications meet the needs of the patient, the health professional and the health enterprise as she believes that properly designed and implemented systems lead to patient safety, staff satisfaction and overall gains in efficient service provision. Sue has held senior positions with health IT vendors such as Cerner, Microsoft Health Solutions Group, Cardinal Health and Per Se Technologies. Her roles have encompassed utilising skills such as Implementation Specialist to Business Development, Nursing Advocacy and Clinical Governance. She joined the Datacom Health team in November 2014. HISA breakfasts have been approved for up to 1.5 contact hour of continuing education credit toward renewal of the CHIA credential. Click here for more information on becoming a certified health informatics professional.